SeroVital Review. Types of Products, How it works, Pros and cons. Can SeroVital help increase HGH? Probably, but short-term results. Read this detailed review of ingredients, side effects, and benefits. 5. How Does SeroVital Work? For years adults, especially women have been on the search for that anti-aging formula, and it might seem we have found one SeroVital, or have we? With endorsements from Dr. Lisa Masterson (from ‘The Doctors’ show) and Kym Douglas, a beauty expert, these supplements have been used by women from all walks of life to slow down the aging process. But, does it increase your HGH levels or combat aging? Serovital is designed to help with weight loss, promote healthy bones, and enhance your mood. According to the Official website, SeroVital is a clinically tested supplement that increases the Human Growth Hormone by 682%. But, for us to understand how the supplements work, we have to know what HGH is and its role in the human body. Human Growth Hormone is excreted by the pituitary gland– a pea-shaped structure at the base of the brain. This essential hormone promotes growth in children and adolescents. Furthermore, it helps in regulating body composition, muscle and bone growth, and sugar and fat metabolism. Though HGH is naturally found in the body, its production tends to reduce with age creating the need for injections. These HGH injections are approved for treating poor growth and unexplained shortness. In adults, however, the injections are used to treat short bowel syndrome, muscle wasting due to HIV/AIDS, and HGH deficiency due to a pituitary tumor (rare). SanMedica International, a nutraceutical Company, based in Salt Lake City, Utah is behind SeroVital among other products. L-lysine is an essential amino acid and a building block for protein. Furthermore, it promotes collagen and carnitine (converts fatty acids into energy) production. Plus, Lysine helps to lower cholesterol levels, and according to PubMed, it can promote GH production, but if combined with other amino acids like arginine and ornithine. Arginine, an essential amino acid is used for the biosynthesis of proteins and production of nitric acid–vital in blood circulation. Plus, it is vital in wound healing, maintaining hormone and immune function, and helps the kidneys eliminate waste. According to research published on PubMed, arginine can increase HGH production when combined with exercise. It originates from L-cysteine and is used as medicine to counteract carbon monoxide poisoning. And, it increases glutathione, a powerful antioxidant. It is also known as Pyroglutamic acid. Although it is a ubiquitous amino acid, Oxy-proline is rarely studied. So, its effectiveness in promoting HGH production is not known. Glutamine is an amino acid which helps in the biosynthesis of proteins. Additionally, it maintains muscle, boosts the immune system, supports GIT health, and sustains healthy levels of the growth hormone. It is a herb used for common cold, fever, sore throat, and heavy menstrual period. But, there is Insufficient evidence on its effectiveness in HGH production. According to SanMedica International, SeroVital works by stimulating the pituitary gland through its blend of amino acids– believed to increase the production of HGH. However, the Company does not include the amounts of amino acids used in each product. So, it’s difficult to know if the powder is effective or not. SanMedica International claims that their supplements increase the HGH levels by 682% on average–a conclusion is drawn from a clinical trial involving 16 subjects. They also claim the supplements enhance mood, promote healthy bones, and weight loss. But, hold on; these benefits are directly linked to HGH, not SeroVital! Yes, the Company states they have researched on their product, and they found it to be effective in slowing down aging. Even though SeroVital is marketed as a women’s supplement, the research was done in men– Why? They do not provide links for the said clinical study, and it is hard to determine if the claims true or false. While Human Growth Hormone can help to improve lean muscle, there is no evidence that SeroVital supplements aid in weight loss. If weight loss is your desired result, you can consider weight loss supplements like Zantrex Black which aid in fat loss. But, remember, only exercise and diet can produce long-term weight loss results. SeroVital recommends four capsules a day for effective results. SanMedica International recommend four capsules a day an empty stomach either two hours before breakfast or two hours after dinner, but before bedtime. Warning: Don’t exceed the four capsules in 24 hours. And, don’t eat two hours before or after taking the supplements. Warning: Do not take SeroVital if you have healthy growth hormone levels as it can affect your health. SanMedica International states that people with healthy levels of HGH can take the supplements, but don’t consume them without a go-ahead from your doctor. 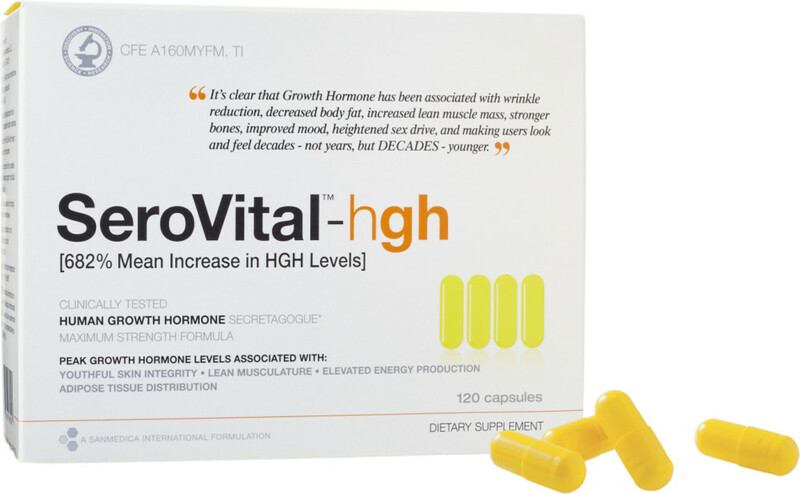 Besides SeroVital supplements, other dietary pills and powders can increase the HGH levels in the body. Growth Factor 9 is in so many ways similar to SeroVital in that it promises to increase the HGH production by 682%, and, it contains the same amino acids. But, GF9 is marketed as supplements for men while SeroVital is for women. GenF20 is available as a dietary supplement and spray. Although GenF20 is similar to SeroVital in the ingredients, it also contains Tyrosine, Valine, GABA, Colostrum, and Ornithine– which is twice as effective as arginine. Thrive HGH is the SAME as SeroVital in ingredients formulation, function, effectiveness, and cost. According to some of the reviews, SeroVital does work, but temporarily. The inclusion of the amino acids will help increase the HGH in the body. But, the choice of the amino acids is wanting. Yes, Lysine, arginine and glutamate work in the production of the growth hormone, the exclusion of amino acids like Tyrosine, and Ornithine makes it less effective. Tyrosine and ornithine are more effective than arginine and lysine combined. SeroVital can be bought from Amazon at $116.45 and the Official Website at $99 for a month’s supply. Yes, SanMedica International offers a hassle-free Money-back guarantee. But, don’t think it’s free, a shipping and handling fees are deducted. If SeroVital doesn’t work, you can return to this address within 30 days after purchase. Several people have filed class actions against SanMedica International. In all these class actions, one thing was clear; SeroVital advertisements are misleading. The plaintiffs claimed that the supplements didn’t increase the HGH levels in the body. SanMedica International claims that SeroVital rapidly increases the growth hormone by 682%. But according to a private investigation, the products have no effect on the body and does not promote or slow down the aging process. Although a judge dismissed the class action in 2014, another plaintiff, Paul Martin filed a class action against the Company. If certified as proposed, Paul’s plaintiff class will include all consumers who purchased SeroVital since 2012. Would I recommend SeroVital? Probably not. And, here is why. Amino acids are required in large amounts to trigger HGH production. SeroVital amino acids amount are minimal to have any effect in increasing growth hormone. Yes, the supplements are rich in amino acids, but still lacks some of the most vital amino acids– tyrosine, valine, and ornithine. Research states ornithine is more effective than arginine. Supplements like GenF20 are better than SeroVital in that it contains better amino acids and ingredients blend. 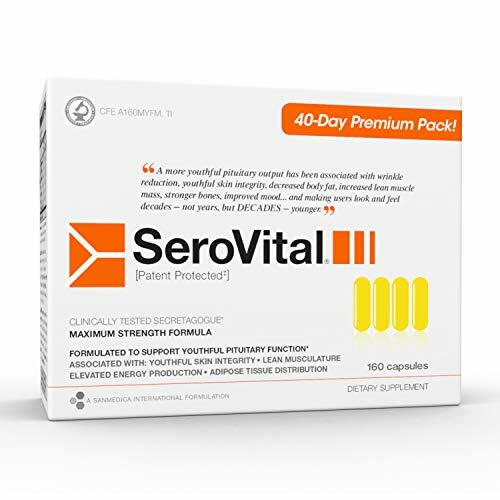 If you are still curious about SeroVital, you can easily purchase the supplements from the Official website and Amazon. Does SeroVital contain the HGH hormone? No. The supplements are a blend of amino acids that are purported to increase the HGH production in the body by stimulating the pituitary gland. How long should I take SeroVital? According to SanMedica International, you can take the supplements for as long as you want. But, be warned; these and any other HGH supplements are not for healthy individuals. Abusing HGH can trigger a host of health effects. What if I stop taking Serovital? Although the Company states there are no withdrawal symptoms, some users have reported that they have experienced decreased energy levels and drowsiness. Furthermore, research states that GH withdrawal can have side effects like depression, lethargy, irritability and at times depression. Are there other ways to increase Growth Hormone naturally? Copper which is needed for the production of red blood cells. Plus, it increases growth hormone secretion. You can get copper from Oysters, whole grains, nuts, dark leafy greens, beans, and organ meats. Vitamin E contains antioxidants that fight free radicals responsible for aging. Furthermore, it restores elasticity, and according to PubMed, it increases GH.